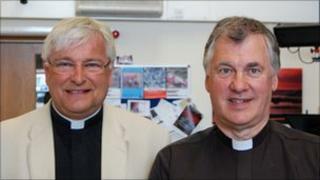 Guernsey's Anglican Dean has said he is worried about the impact of an ongoing review into church funding. The island's Parochial Ecclesiastical Rates Review Committee (PERRC) expects to report on the issue this year. It will recommend whether the parish churches and rectory buildings should continue to be funded by ratepayers. The Very Rev Paul Mellor said: "I am very concerned about the built historic heritage. In Guernsey, unlike England, the Church does not own the buildings." He said greater administration costs in England meant a "deficit of repairs that need doing." In Guernsey "every penny raised goes to pay the man who puts the nails in the roof", he said. Canon Mellor said there was a lot of misinformation about what the rates supported. He said: "It is purely to maintain the historic fabric. None of it goes towards the religious purposes of the buildings. "The Town Church is an extremely busy place. It's heated and lighted by the people who are members of the congregation. All the expenses of the clergy are paid for by the Church and not by the parishioners." Catholic Church buildings in Guernsey are financed and maintained by the congregation, rather than parish ratepayers. Image caption The Rev Billy Gilvear said parish rates should not be spent on buildings many did not "want or need"
When asked if his Church would prefer to receive funding similar to that of the Anglican Church, the leader of the Catholic Church in Guernsey, Father Michael Hore, said: "I suppose we wouldn't say no but these are historic churches." "If someone said tomorrow morning 'we'll bulldoze down St Saviour's Church' there'd rightly be an outcry." However the Reverend Billy Gilvear, the Baptist minister at Shiloh Church, disagreed. He said: "I don't think rates should be spent on church buildings. I don't think it's fair for local people who don't even attend the church to have to invest in an historic building that they might not believe in or want or need." Deputy Tom Le Pelley, PERRC's chairman, said there were "regal and legal aspects of the rectories and glebe land" that had caused long delays in his committee's presentation of its report to the States. However he has indicated there will be changes. "The situation has changed quite dramatically since 1985, when it was last reviewed," he said. "People's commitment to their faith seems to have diminished somewhat." Who pays for Guernsey's churches?